Vatican Basic Private Tour (3 hours) - Skip the line! Dino was friendly and very knowledgable. We learned so much about the art in the Vatican and the history of the papacy. Even though it was quite crowded he made our tour special by pointing out little details we would have missed on our own. Wish we had had more time for a even more, like the picture gallery. Highly recommend this tour and this guide. TOURSBYLOCALS RESPONSE: Apr 22 (AV) LiveChat - Added a review to this booking based on traveler's request. We did two tours with Dino while in Rome: Ancient Rome and Vatican Basic tours. Dino is a great tour guide as he is very knowledgeable about Rome and the Vatican. I liked his story telling about Rome. You could tell he really enjoys his work because his eyes would light up while telling us the stories. Not just dry facts. His magic bag of pictures and iPad really help convey information. He is patient and flexible. Because we visited during the holidays, he was good on trying to work around the crowds. Dino was an outstanding and highly knowledgeable guide. He provided fascinating commentary that engaged both adults and kids in our group. He knew exactly how to navigate the throngs, the best photo spots, and gave us adequate time to see the major attractions. It was a very high yield tour and he was also extremely warm and friendly to all. As good as they come...a real scholar ! Our first time in Italy, and Dino, our guide in Rome, set the pace. He was a wealth of knowledge of all things Vatican and had a clear and complete answer for every question our group of six came up with. He was very professional, and delivered his proficiency of history with warmth and preciseness. Dino pointed things out within the museums that we would never have noticed, all with explanations to ensure our understanding. We hope to hire Dino on our next trip to Rome! Dino's knowledge of Rome and Roman history must be unrivalled. He is the perfect tour guide. If you go on one of Dino's tour, your certainly will not be disappointed...looking forward to our second tour with him tomorrow! I am a year late on this (I highly apologize) But Dino was an excellent tour guide. Very knowledgeable. So interesting. One thing I highly recommend about a private TOUR BY LOCALS tour is the personalization. You can hear your tour guide, answer questions, the tour ends up being customized to your interests. I am always so fascinated with the little things that they know. I highly recommend Dino. You'll will not be disappointed. A must do tour whilst in Rome. Thank goodness we pre booked this tour as Dino was able to take us past the long queues that were waiting to enter the Vatican Museum. The crowds were large but Dino pointed out everything of interest and explained so much that we would have otherwise have missed. His knowledge of the Vatican Museum, Sistine Chapel and St Peters Bascilica are second to none. That's Dino. My granddaughter and I just completed a 3-hour private tour of the Vatican . Dino was a superb guide, highly professional, incredibly well informed, completely instructive re: customs, dress codes for specific sites, rules of conduct, etc. He showed obvious concern for our comfort - on an extremely hot day - offering water and restroom breaks, keeping our time in the sun to a minimum, cautioning us about safe drinking water, licensed taxi-cabs, etc. Could not have asked for better! Dino was an awesome tour guide. He was incredibly knowledgeable and so enthusiastic about everything in the Vatican. He was well prepared with visual aides to help us understand and follow along with the information he provided. He tailored the tour exactly as we wanted and we were able to see and experience everything we hoped. We really could not be happier. Dino is a pro. One of the highlights of Rome was our tour with Dino of the Vatican. Highly recommended! Dino was amazing! The knowledge of the subjects was incredible and he managed to take the age range of 80 to 16 into account and make it interesting for all. I would highly recommend Dino again! Can't wait to come back! Extremely enjoyed our tour with Dino! He makes everything very interesting and shares a lot of knowledge. Dino was a charming, very knowledgeable guide who gave us a wonderful tour of the Vatican, Sistine Chapel and St Peter's Basilica. He took time to tell us in detail what we were about to see and it was all so interesting that time flew by. He looked after us at all times and made sure we were together before giving us information. His enthusiasm was catching and we were fascinated by the history and stories of life in Vatican City. I would certainly recommend him as an excellent guide. It is difficult to imagine visiting the Vaican without a guide, and now that we have toured with Dino, we are so glad we visited there with him! He is well organized and a vast storehouse of knowledge. The tour was entertaining and informative. Dino speaks English fluently, clearly loves what he does, and was so pleasant and helpful, we would give him more stars if we could. Dino was amazing! We bypassed all the lines. He gave us an in-depth history of the Vatican as well as the art. He used pictures of the Sistine Chapel ceiling to give us things to look for and to understand the paintings since you can not talk inside the chapel. Don't even try to see the Vatican without a guide, you will miss so much. I highly recommend DIno! Dino was excellent! He was very knowledgeable. He has studied for over 9 years. He was passionate about his work, and encouraged us to ask questions. He spoke very good English, and negotiated us through the very large crowds. Although we have been to the Vatican several times, we still learned many new and interesting facts. Dino was great! He knew all the tips and tricks that we would never had known without him. He was very knowledgeable and over all just a pleasure to have with us! We would use him again in a heart beat! Dino was an absolute star. We had him join us for lunch between a morning tour and the afternoon Vatican tour. In addition to informative commentary, he has a "Mary Poppins" bag full of supplementary information: "then and now" pictures, maps, and an iPad full of illustrations to help understand the recent as well as ancient history of Rome. His Vatican museums and cathedral itinerary and commentary were perfect for our knowledge and interest level. Take Vatican "skip the line," you avoid wasted time. Dino was a wonderful guide. He was extremely knowledgeable and enthusiastic about everything he showed us in the Vatican museum, the Sistine chapel and St Peter's. I would highly recommend him. Dino met us at our hotel and professionally guided us through the maze of the Vatican, Sistine Chapel and St. Peter's. He knew all of the short cuts and we did not wait in any lines! 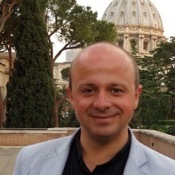 He is a wealth of information on the art and history of the Vatican. He prepared us for what we were going to see, so we were able to view in peace. He was respectful of our time and helped us discover which details interested our family. Ask for Dino!! We toured the Vatican on a Saturday of a holiday weekend. The crowds were like nothing we have ever seen. Dino was unbelievable at getting us through the lines. Dino's knowledge and passion were amazing and helped us really appreciate what we were experiencing and this was more than a tour it was an amazing experience Even with the crowd we never felt rushed. He gave us a miniclass with a poster of the Sistine Chapel before we went in that really helped us appreciate what we were seeing. Dino has extraordinary knowledge of Roman and art history, and he has a wonderful way of sharing it. Highly recommend his tours. WE had Dino for a Vatican tour on one day and the Coliseum and Forum on another. He is a true Scholar. We were able to ballroom dance in the Sistine Chapel(this means see it sans crowds.) We learned a lot and had fun at the same time. Our dream is to return to Italy some day and enjoy other treasures and other cities with Dino as our guide. We booked him several months in advance; we think he is the best; incomparable. Take his advice while booking; you can't go wrong. Dino was one of the best guides we have ever had. if there was a 10 star he'd get 20!! A thorough professional right down to his snazzy jacket we scored big-time with him. He had an immensely difficult job taking in the Colusseum(sorry Dino, the Flavian amphitheatre! )and ancient Rome. You simply cannot do this without him. A torrent of interesting and witty information leavened with a natural modesty and patience he is everything you could wish for. Others leant in to catch his talks. Dino - WE LOVE YOU!! We really enjoyed how Dino would sit with us for a few minutes before each section of our Vatican tour and go over the big picture of what we were getting ready to see. That made it even more meaningful when he pointed out specifics as we went through the various spaces. Great tour. The tour of the Vatican museums, the Sistine Chapel and St Peter's Basilica with Dino was sensational and profound. Dino was extremely knowledgeable and we had a great conversation with him about the history, spiritual significance and symbolism of the art and the places. The Tours by Locals is really worth the investment, even more so when seeing the very long queues for tickets. Dino clearly loves what he does, so that makes touring with him a great experience. We also booked a tour of Ancient Rome with him and his command of knowledge and communication skills on both tours were superlative. We thoroughly enjoyed both tours. We had a wonderful tour with Dino in the Vatican. He is very knowledgable and his english is great. The vatican is a large place and you can get lost in it visually. Having Dino with his vast knowledge and anecdotes has made this a superb experience. A must! What a great way to see the Vatican Museum, Sistine Chapel and St. Peter's. Visiting in July meant long lineups which we were able to avoid with our private tour. Dino kept all nine of us entertained (age 9 to 50) and educating us on so much of the history of the Vatican. An excellent 3 hour tour. Dino is friendly, knowledgeable and helpful. His guided tour is well worth the time and money! Mario had a hard act to follow given Maria the day before. He was however, pleasant, and well informed but less personable than the other tour guide. We enjoyed our day with Dino greatly! Thank you for explaining all the wonderful art to us so clearly. TOUR GUIDE RESPONSE: THANK YOU for your nice review Mrs. Powell!! I've enjoyed the tour done with you! This was the 2nd tour our family booked with Dino and we were not disappointed once again - Dino provides an excellent background and history that makes the most sacred of places even more intriguing and interesting. Skip the line tickets are a must and Dino will more than assuredly provide the rest so that your tour is worth whatever money you spend! It is difficult to give sufficient praise to Dino for what was a marvellous 3 hour tour of the Vatican. His presentation and knowledge were formidable to say the least. He took us through a short introductory briefing of the Sistine Chapel works and the history of St Peters at the beginning of the tour which was particularly valuable as it set the background for the remainder of the tour. We cannot recommend Dino and Tours by Locals more highly. If you want the very best tour of the Vatican book Dino! Dino was awesome! He knows the Vatican so well and was entertaining to listen to. He was on time for our tour and was just overall very enjoyable to spend 3.5 hours with! I highly recommend using him for your tour! Well worth the money! Dino was excellent. We combined the vatican and ancient rome tours in one day, and he kept it fresh and entertaining the whole day. Dino did a great job of providing a lot of information in a way that was not overwhelming.... He seems to truly enjoy showing people around Rome. Dino was very knowledgeable and explained everything in great detail. We very much enjoyed the tour. Dino was a wonderful guide with an extraordinary knowledge of the Vatican. He was on time, very pleasant personality and made the Vatican tour very interesting and a learning experience. We would highly recommend Dino and this tour. His knowledge of all the aspects of the Vatican and the exhibits, inlcuding the Sistene Chapel was amazing. TOUR GUIDE RESPONSE: Thanks a lot Mr. Donsky for this wonderful review!! I really appreciate your words. Thanks again! Dino was very knowledgeable and professional. Especially important to us was Dino being very courteous and accommodating to my wife and me due to our ages and physical condition. Dino was patient with us and answered all our questions...some more than once. He made history enjoyable and easy to understand. I have memories that will stay with me due to Dino using logical approach to presentation. Perhaps the best tour we have ever had!! TOUR GUIDE RESPONSE: Thank you a lot Mr. Pittard for your nice review! !